Remember, they're not rejecting you! Yes, most of those carefully worded queries will be sent back again, some of them after weeks of waiting, and chances are most will contain a form letter saying thanks but no thanks. The problem is that all form rejections are similar: "Doesn't suit our list", "Doesn't fit our current requirements", etc. Every submission is elevated into the highest category by default, and while that eases the pain it can also give you a false sense of security. I know when I started out I was submitting some real rubbish, but because the rejections were along the lines of "Doesn't suit our needs at this time" I didn't really know it. Ideally, the rejections should have said 'learn to write then try again', but after getting a few of those I'd probably have given up submitting. There is one clue to look out for: an invitation to submit again. If the letter contains actual praise AND asks you to send more work, there's a good chance your manuscript is in the green category on the Pyramid 'o' doom (second from the top). You write well, you can put a plot together, but you need to make it more compelling and/or lose the Buffy or Star Wars characters. Now, in the ideal world a rejection letter would include a copy of the pyramid with a big ring around the category your manuscript falls into - at least, according to the person doing the rejecting. Agents would pop in a note which said 'Learn grammar' or 'Learn plotting techniques' or 'Sorry, doesn't suit our list (really)" and authors would know where they stood. That way you could immediately arm yourself with books and websites on your weak area, immerse yourself in several months of intensive study and emerge a better, more effective writer. Dialogue not up to scratch? 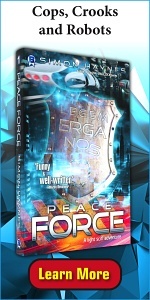 Grab a book on the subject and start reading. Punctuation up the chute? Likewise. You could make yourself stronger, better, faster in the areas of weakness and then revise your manuscript and start the submission process again, knocking them dead with your zingy dialogue and snappy punctuation. Then, if the plot is a bit jaded you read something like this. Before you know it you're working on a new novel, incorporating all the techniques gleaned from your study of books and websites. There's a progression, a learning curve, and you're on it. Of course, agents who gave honest feedback would be swamped by a tsunami of vitriol from aggrieved and hurting writers, which is why they don't do this. If someone's just spent two years writing their first novel they don't want to hear that they've yet to master basic grammar. Yes, it would save them a lot of postage but it's a lot easier on the ego when you gradually come to realise something. Weak grammar, spelling, punctuation? Throw out the TV remote and read. My point is that during all my years of schooling I never once had a lesson in punctuation, grammar or spelling - at least, not in English. I picked up everything from reading, and that's probably the easiest way to improve your skills in those areas. Also, remember that there's nothing wrong with plain writing. People read fiction for the ideas and adventure, not to marvel at the author's skillful use of a thesaurus. (Okay, literature maybe. But I'm not a literary writer.) If you're not 100% confident with the words and sentence constructions you're sticking on the page, take it down a notch. The other way to test your grammar and spelling is to participate in an online writing group. You don't even have to submit your own writing ... just read the other submissions and - most importantly - the feedback comments associated with them. If you can see flaws others can't, that's good. If you think a piece is terrific but ten other people have torn it apart at great length, then you should study those critiques closely and then re-read the submission until you can see what they're on about. Beware of writing groups where everyone is best buddies and nobody offers constructive criticism. These are less than useless, since everyone is so busy congratulating each other they don't get around to pointing out flaws, and to post an actual critique is to lob a stink bomb into the back-slapping and congratulatory crowd. In fact, the best writing groups are those with complete strangers unafraid to express their opinions. Just don't commit the cardinal sin of explaining what you actually meant - which means it wasn't clear to begin with - or arguing with a critique, which is like telling someone they chose the wrong make of car. Technical skills are the next step on the pyramid. Once again you can pick up the basics by reading the kind of books you want to write. However, you can also get hold of books on dialogue, plotting and characterisation and compare your own work to the examples. If you rewrite a section of dialogue using their hints, does it scan better? I'm betting it does. At first you'll be drowning in rules and information, but after a while you'll grab hold of some, and bit by bit you'll find yourself automatically adhering to them. The rest you can weed out when rewriting or revising. Well-written but dull or derivative. This is where plotting comes in, either before you write, during the writing or afterwards, when rewriting your first draft. First, when adding a character to your novel, don't be lazy. Don't re-use Dana Scully or Xander with a new name, because the character will seem awfully familiar to your readers. If you're having trouble building a realistic character you can always start by pinching a trait here and there. Scully's scepticism, Xander's loyalty, Luke's annoying whining ... Mix in enough bits and pieces and the parts become a unique whole. To combat a dull plot, try and ratchet up the tension in stages, raising the stakes from beginning to end. An extreme example: don't start with plane wrecks, earthquakes and volcano eruptions and then have the hero/ine spend twenty chapters researching climate change in the library. Remember, this is the ONLY response most publishers and agents send out. Why? Because it's impossible to argue with. Doesn't fit the list. If this is really and truly meant, then you're on the right track. All you have to do is keep submitting until you find a list it does fit. However, unless the letter asks you to submit your next proposal to the agent, it's almost certainly a generic form letter. "I'm afraid we can't use your submission at this time" and other similar comments fall into the same category - don't waste time trying to read meaning into them. Summary. Climbing the rejection pyramid is a huge task, and it's vital you're honest with yourself. 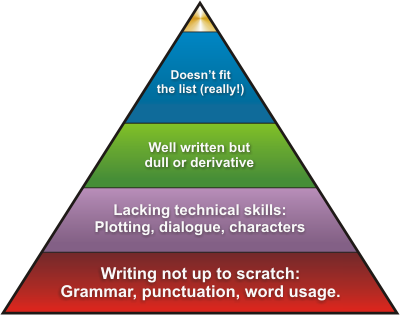 If you're at the 'lacking technical skills' stage there's not a lot of point adding more zap and kerpow to your novel in the hope it will sell. However, if you master each level until you're writing books that are genuinely ready for publication, then it's just a matter of time before an agent snaps you up. Please remember that none of my articles are meant to discourage. In fact, they're all written for the me of ten years ago, the writer who was ready to take the next step but didn't know what that step was. About the author: Simon Haynes is the author of the Hal Spacejock, Harriet Walsh and Hal Junior series. Simon is also a freelance programmer, and he designed and wrote all the software on spacejock.com (e.g. yWriter).